A Happy Healthy Mummy: Swimming: A change is as good as a rest! Swimming: A change is as good as a rest! Recently I picked up an Achilles injury and had to face the fact that the high-impact workouts that I normally enjoy (such as running and Body Combat classes) would have to be put on hold until I was back to full strength. The easiest thing to do would have been to throw a massive strop and give up altogether - busying myself with the multitude of Christmassy responsibilities I currently have on my Things To Do List. And don't think I wasn't tempted! Instead though I headed off for a gym assessment and got myself a new little workout using a stationary bike and rower for fat-burning, with lots of free weight routines to cover the strength and toning side of things too. I also determined that it was high time I improved my swimming. In what was a watershed moment over the summer, I realised my six year old can swim better than me. Admittedly, she's been putting in the work. She's swum at least once a week, every week from being a baby! Even when we go on our holidays there's no let up as we usually head off to the beaches in Cornwall, and have also dallied with Centerparcs and Ibiza. Both my girls are fully equipped for the water with an array of cozzies, wetsuits, goggles and even aqua shoes. In fact my older daughter wanted a full length wetsuit for Christmas, so she can go open water swimming in the river just like Daddy! She's eight. Until a couple of weeks ago, if you'd seen me in the pool, you would have observed a woman whose hair only got wet if someone else splashed her as they passed by. I was an awkward breaststroke kind of gal, with my head held clear of the pool, cricking my neck as I slowly went back and forth wondering if it was over yet. I failed to see how swimming could form any part of my workout as I was just 'treading water' until it was time to enjoy the jacuzzi! Clearly, it was time for me to take the plunge in the rather lovely pool at the gym, and so armed with my husband's highly-effective Aqua Sphere goggles (they make all the difference trust me) I strapped on my bikini and gritted my teeth. Using the tips I'd picked up from my daughters' swimming lessons I set off in front crawl using bilateral breathing every three strokes - with my face properly down in the water. To be honest, I really struggled at first, constantly inhaling water at the wrong time and coughing and spluttering as I barely managed a length of 'proper' swimming. I wouldn't have wanted to be the lifeguard on duty that day I can tell you! But gradually as I've been putting the time in, I have improved. I've progressed enough to be able to swim solidly for 20 minutes - although I'm not doing tumble turns at the ends or anything like that! When I finish I'm out of breath too - and I'm hoping this means it is cardio exercise rather than just trauma! An OAP at the aqua aerobic class even said that she wished she could swim like me (clearly a woman of low ambition!!). I usually fit the swim in after a visit to the gym, so I feel like I am maintaining my fitness level while I can't follow my normal regime - and potentially working a whole new set of muscles. 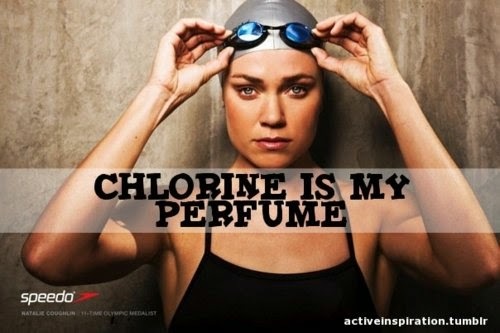 It's true, I'm no Hannah Young - but I can at least describe my aqua antics as swimming now! If you're tempted to follow in my watery footsteps, there's a great explanation on why swimming is good for you here - and the BBC have a great skills guide to front crawl here, if you'd like to improve your technique too. Without exercise in my life, I think I'd go a bit loopy, it's part of my daily routine now and I rely on it to keep my mind and my body healthy. And even when I'm up and running again I'll still make time for swimming, as it really floats my boat (sorry, that was a-pool-ing!). How about you? Do you enjoy swimming - and can you swim well enough for it to be a workout? Have you had lessons as an adult? Let me know if you sink or swim in the comment box below! I love swimming! When I was a child, it was the only sporting arena I excelled in. Still enjoy it now, but do find lengths in an indoor pool can get a bit monotonous. Wish there was a lido nearer to where I live (for the summer months anyway). Well, there's always the river! Can't imagine that gets boring... I have heard tell of wireless earphones that you can use to have music as you swim. Hello, Great concepts. I would not shy away from any search engine. From my perspective, you could actually target older people because bing is automatically installed on most pcs.